There is some truth to both of these statements but, be careful; neither of these statements are completely true. To make the best decision on what wire diameter to use, it helps to understand how wire diameter and the effect of amperage through the wire affect the weld deposit. Suppose you have a 3/32” SAW wire and a 5/32” SAW wire both operating at 600 amps. Which wire produces the deepest penetration? As the amperage flows through the smaller diameter wire, the density (or concentration) of current is greater than that same current flowing through a larger diameter wire. The greater the current density, the deeper the penetration. As a result, the smaller diameter wire will penetrate deeper than a larger diameter wire at the same current (assuming all other factors, like travel speed, are held constant). Figure 6.31 demonstrates this concept. However, every wire has a certain current density capacity. If the amperage flowing through the wire becomes too great, the welding arc becomes unstable and erratic. At that point, it is time to increase the wire diameter. This will lower the current density and stabilize the arc. Conversely, if the amperage is too low for a wire diameter, the arc will want to “pop”, stick, and produce excessive spatter. At this point, a smaller wire diameter may fix the problem. With regard to deposition rate (the amount of weld metal that can be deposited in lbs/hour), smaller diameter wires must have a greater wire feed speed to achieve the same amperage in a larger diameter wire. For example, the 3/32” wire described earlier has a wire feed speed of 150 inches per minute to achieve 600 amps. The 5/32” wire has a wire feed speed of approximately 45 inches per minute. As a result of the increased wire feed speed of the 3/32” wire, it will deposit about 17.3 lbs/hr. The 5/32” diameter electrode at 600 amps deposits approximately 14.7 lbs/ hr. The greater deposition rate using the smaller 3/32” wire can allow for faster travel speeds and potentially increase production. 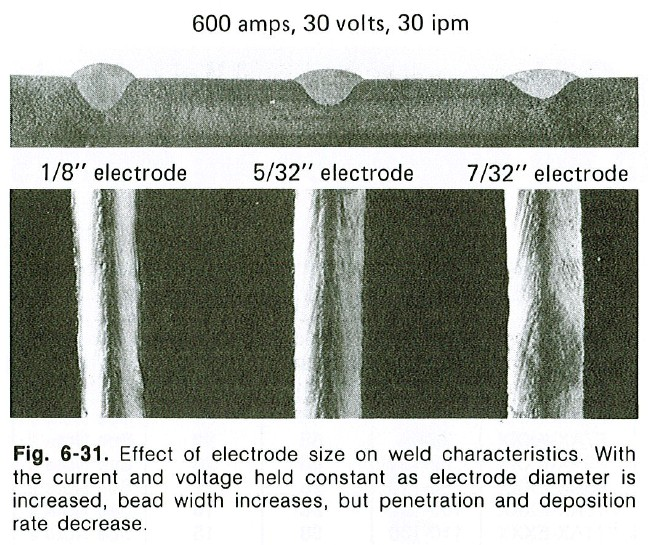 While the above examples used submerged arc wire, the same principles hold true for MIG and FCAW welding. 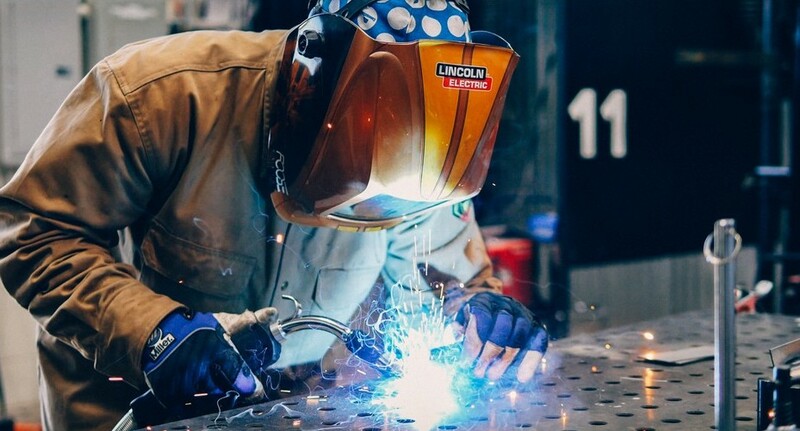 Paying attention to the manufacturer’s recommended procedures for wires can help to optimize productivity and quality by selecting the right diameter wire for the job. If you have any questions regarding this topic, be sure to reach out to your representatives at General Air.